Amazing! Was there a specific date attached to the image? And, the enormous dirt pile is finally gone! According to his description, 8/20/17 at 11:15 AM at 5000 feet. While they were digging out the SW land, they put all the dirt over in a pile by Toon Town. The pile was few stories high. That's been gone for a long time. Yup. Probably a good 8 to 9 months now. We’ll let it go this time, but don’t let it happen again. Not exactly a construction project update, but in the next few weeks the DLR will be upgrading to the same card reading terminals that WDW has, which will FINALLY bring Apple Pay and Android Pay to the resort. And yet, for whatever reason, they won't allow guests to make NFC-based purchases with something like a Magic Band (TM) or Annual Pass that is either tied to a bank account or pre-loaded with a fixed amount of money. [/mini rant] We now return you to your regularly scheduled DLR project tracking. 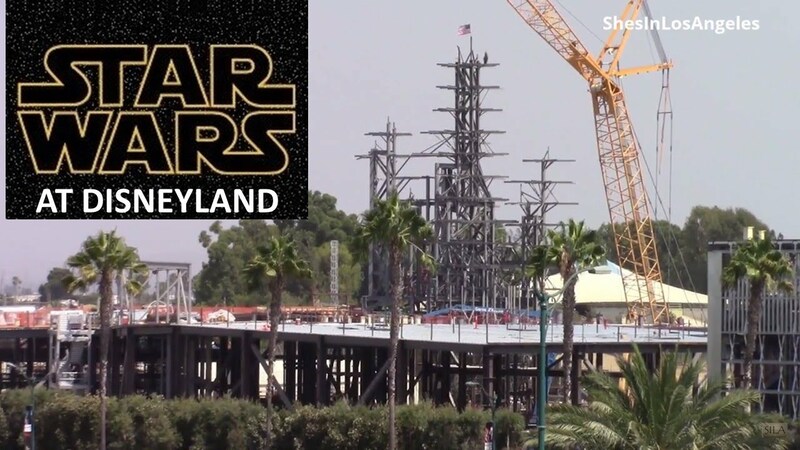 1) We've talked a lot about how the BE building is the biggest attraction Disney has ever built, but the MF building isn't far behind. It's definitely going to be another attraction that can encompass a lot of guests, whether actually riding or just standing in line. 2) I wonder what the big dirt ramp, that makes up a lot of the eastern border of SWGE, is for. Its outer side is a flat wall that faces the train tracks, but it's not exactly part of the berm, because the trees are between it and the train track and there are no trees atop it. Again, it's pretty wide and looks like a ramp up to something. Does the model of SWGE tell us anything about what it will end up being? Possibly they are just storing some more dirt for later use. I wonder what the big dirt ramp, that makes up a lot of the eastern border of SWGE, is for. Its outer side is a flat wall that faces the train tracks, but it's not exactly part of the berm, because the trees are between it and the train track and there are no trees atop it. Again, it's pretty wide and looks like a ramp up to something. Does the model of SWGE tell us anything about what it will end up being? That is the buffer they purposely built to separate SWGE from the Fantasyland Theatre and create the tunnel for the DLRR to continue on to the Toontown station. It isn't going anywhere as it is part of the original plan. It just looks like a ramp from an aerial view. They used the same construction technique for the basement of the BE building and terminating the end of the original berm behind the Hungry Bear. A couple more notes about this. The backstage N-S access tunnel goes under this berm. The previous DLRR tunnel is partially covered by this berm. They seemed to have left much or all of that tunnel when they built the new tunnel/bridge. Check yensid's pics/videos for this. It's likely when they complete SWL that they will plant trees there to hide potential views of the Fantasyland Theater and ToonTown. Two new SILA videos from yesterday 8/25/17. 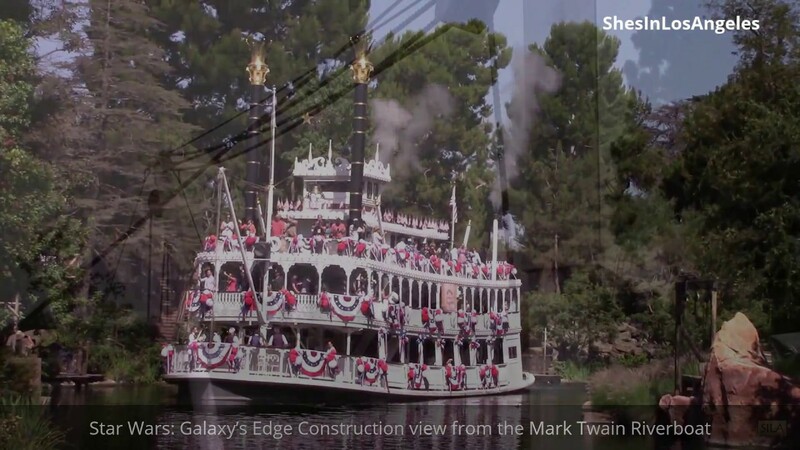 SWGE construction from the Mark Twain. Quite a bit more steel structure to support rock work on the BE building. At 2:00 it looks as though the steel structure for rock work on the MF building has been topped out as they've installed an US flag on top. SWGE construction from Disneyland Dr. and M&F parking structure. From street level the massive scale of the MF and BE buildings is quite amazing. At 3:00 and 6:20 a worker applying fireproofing on the steel structure of the BE building. 4:40 welded wire mesh in place ready to pour concrete on the roof of the BE building over the Launch Bay. 9:30 a small tree next to the US flag on top of the steel rock support structure on the MF building. 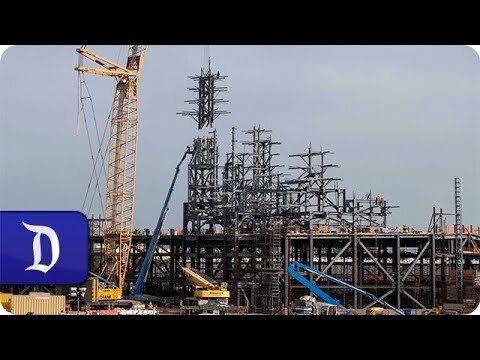 A short video from Walt Disney Imagineering showing the topping out of the tallest peak in SWGE at 130 feet. They had a ceremony and invited cast members to sign the steel structure before it was hoisted into place...very cool!